What are people saying about your brand? I am not speaking about those paid advertisements or reviews on popular blogs that you have been orchestrating. I mean real, organic brand mentions from your user base. Chances are you have no idea, not unless it has been a major complaint that has come directly through your customer service office. Or you may be missing social media interaction under the surface, leaving your reputation vulnerable. We all know that social reputation management is a critical part of running any business in the digital world of today. So how do we make sure we are really taking advantage of it? By having the right tools in our corner to monitor, analyze and respond to every single relevant brand mention on the web. It isn’t enough that people are talking about your brand, they have to be saying good things. And if they are saying bad things you have to be able to quickly respond. “Understanding Customers” by Ruby Newell-Legner it takes 12 positive experiences for a customer to feel better about a single negative experience. And an American Express Survey also found that 78% of customers will back out of a purchase because of a bad service experience with a company. All of this leads us to one conclusion: keeping customers happy is a major part of success and profitability, and part of doing that is making sure you catch problems early. That is what makes sentiment management such a big part of social media interaction and marketing today. Mention is an awesome tool in the way it operates using a four-goal system: sentiment monitoring, crisis management, competitive analysis, and finding influencers. Using these metrics you can cover every side of your social reputation management plan, all from a single dashboard. They also have brand and media tracking, social media monitoring, and more. All of this is customized for different clients, such as businesses, educational resources, and agencies. In spite of that they have three pricing plans that make it easy to get what you need. Price: I would recommend their Starter plan, which comes with a dashboard, sentiment analysis, and influencers tracking along with five alerts, 5,000 mentions, and a few other goodies for $99 per month. Anything more than that requires a customized plan and pricing on request. It is true that you get what you pay for, so generally speaking you don’t want to rely on free tools for much. 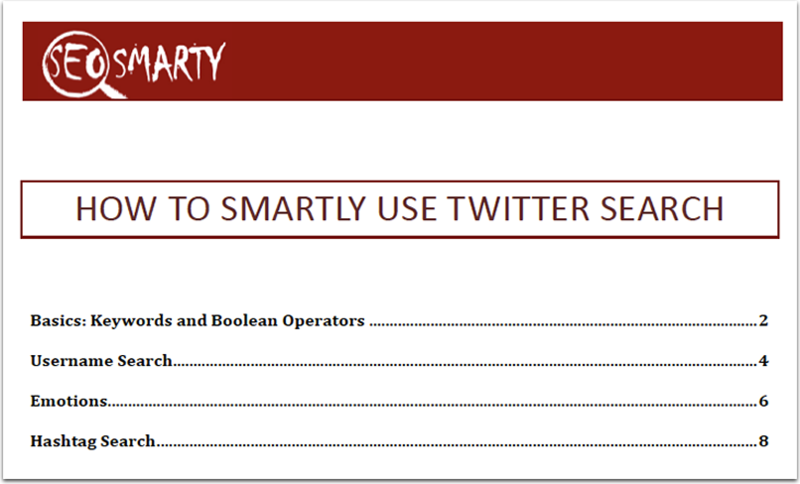 But if you are looking for one to help back up more advanced monitoring software you can’t go wrong with Twitter Advanced Search Tool. Like any search engine, you can get results based on keywords placed anywhere in the tweets, About Me bio, or content. And exactly as Google, you can play with the well-defined boolean operators that are normally supported from search engine to search engine. 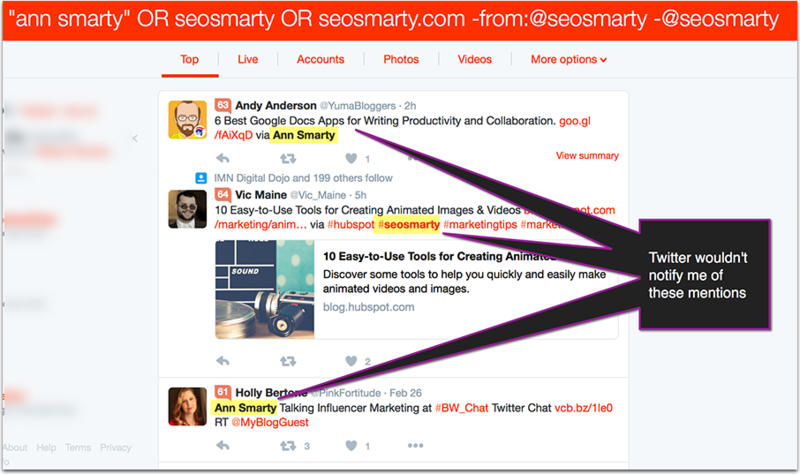 You can search by keywords, without certain keywords, by account, by brand mention, and a whole lot more. 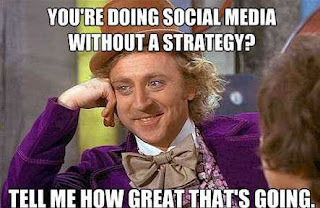 It has the benefit of being proprietary, and no one is better at creating an in-house search than a social website. It gets past a lot of the blocks and noise that come from third party apps, so at the very least it can help you narrow down your direction to use on the others. Bonus: FREE download! Click here to download my own clickable PDF guide that will help you and your team to find and monitor all kinds of brand mentions. Cyfe is not just for brand alerts: It can be set up to monitor almost anything under the sun, including your expenses, sales and customer support teams and more. Cyfe is rather one of those business productivity tools than an exclusively marketing or reputation management solution. For social media, I am using to monitor and archive Twitter mentions using a separate dashboard. Simply set up multiple widgets monitoring all kinds of Twitter search results (see the “Advanced Twitter search” options above) and login once in a while to see archives mentions and decide if there are any you missed. The archive is a great option to have because you are able to find your promoters over time and identify most active ones. Price: Unlimited number of widgets for just $19 per month ($14 per month if paid annually). 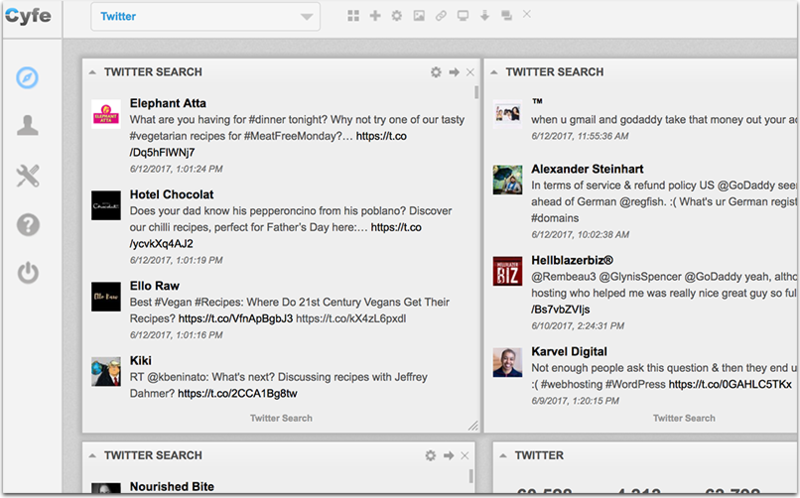 Tweetdeck is one of the oldest tools I am still using a lot. 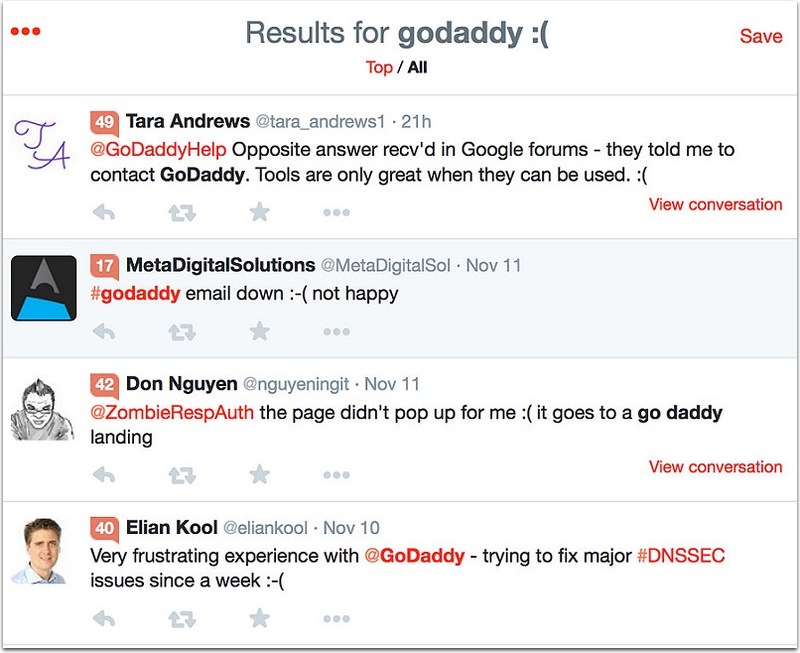 The beauty of the tool is that you don’t need to login anywhere daily to see the mentions. 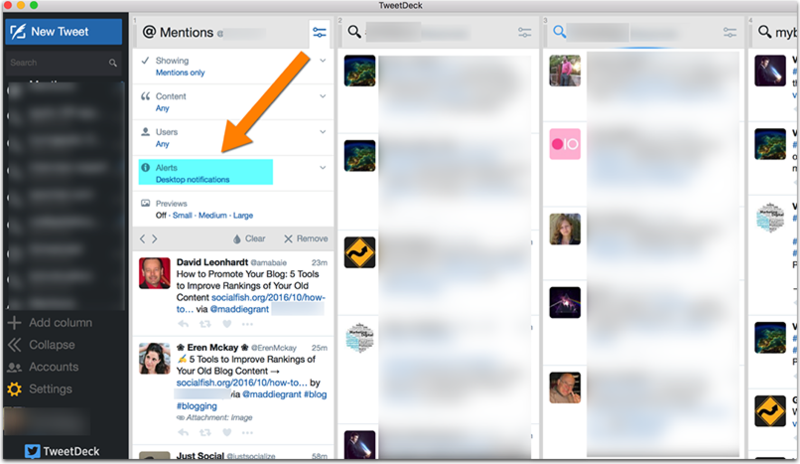 It will deliver them as they happen right to your desktop, based on your notification settings. You can set up multiple columns to monitor all kinds of keyword and domain mentions and only get notified of those updates you choose. Not exactly a reputation management tool, Buzzsumo has a great “Content Alerts” feature that sends you email digests every day notifying you where your brand name has been mentioned. You can use it to monitor your brand name or your company author names. 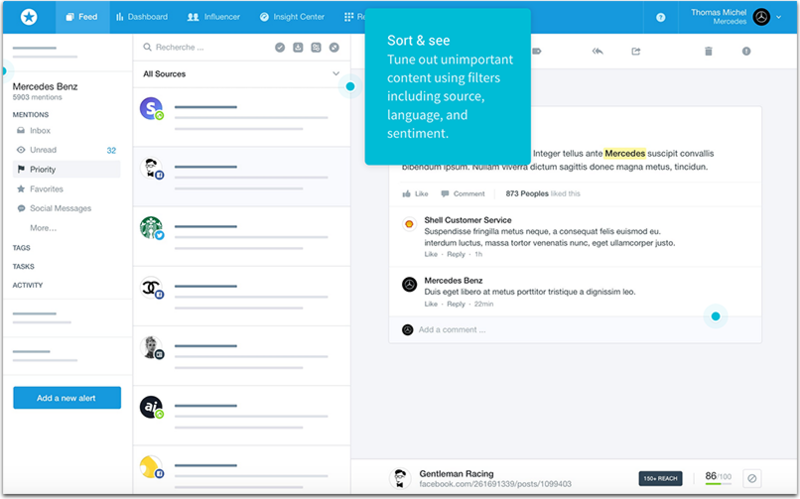 While most of these tools help monitoring and managing social media mentions, search engine sentiment is essential, too. It changes slower than on social media but it still needs your attention. 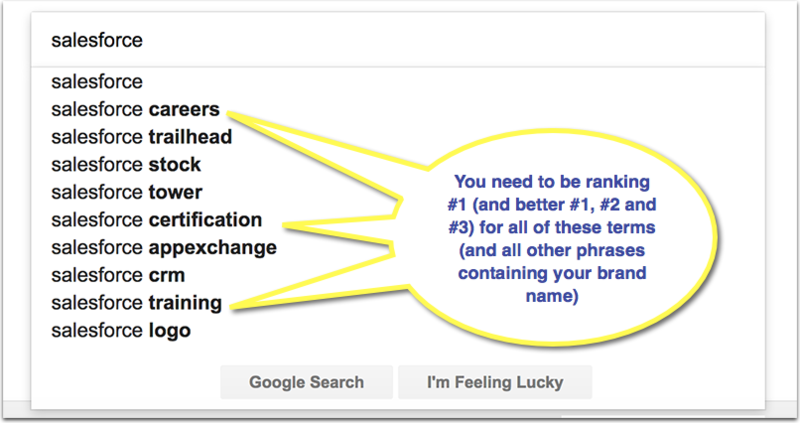 I have previously talked about monitoring search queries that include your brand name and how you need to make sure that you are ranking for all of those long queries that include your name. Serpstat is a great tool allowing to research and monitor search queries that contain your brand name. 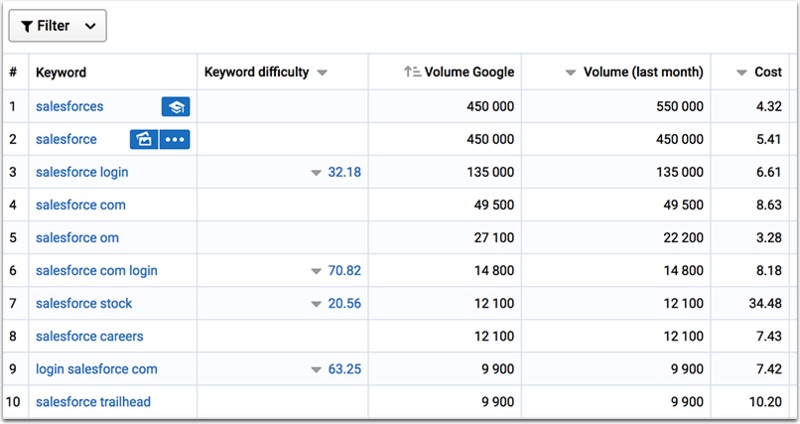 Set up a project, identify those search phrases and add your digital assets to monitor how they rank for those keywords. Surveys, social media accounts, and reviews are all covered under this awesome Excel add-on from Lexalytics. Semantria has an emphasis on getting balanced data for more thorough, helpful reports. Importing is super simple, and the results are clean and easy to read. They even sell in multi-seat packages, so managing multiple projects, accounts or data sources is simple and budget friendly. Of all of the tools on this list, I would say this is one of the very best. You can try it for free to see for yourself. Be sure to check out some of their other cool toys on their site. Talkwalker is a larger scale social media marketing tool that covers a lot of different corners. But if you want global data (and a lot of it) it is a great option. It has image recognition features that take your mentions to a new level… even if they don’t say your brand in the description you can find mentions via images featuring your logo. That is on top of more traditional social listening and monitoring tools that catch a lot more than most monitoring software does. Price: They are a pretty steep product, admittedly… prices start at $8,400 per year for small brands, and go up to $36,000 per year for enterprise customers. But on the plus side they are a more thorough product than you are usually going to find, and they allow for customized demos that show you the features that work best for your company. 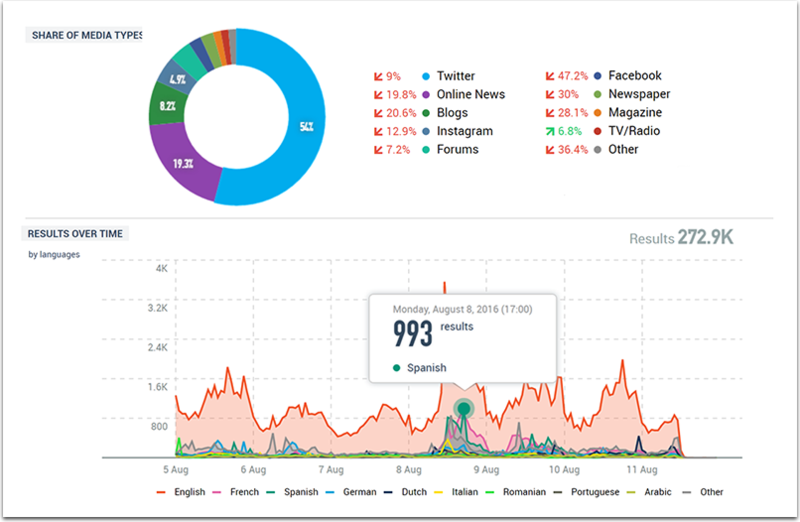 Meltwater is a simpler tool than those above, but it is still very helpful. It works by filtering through the conversations on social media to find harder to see mentions of your brand. It then creates a report that helps you not just to track what is being said, but actually engage in conversation with those users. In the meantime you can also see the larger picture and get a good grasp of patterns in mentions, so you can start to put together a more personalized game plan. They help you to put that data into context, rather than just leaving you to trudge through it alone. You may have come across this tool in the past under its old name, IceRocket. Since then they have made some real improvements that have made this a much more useful, intuitive app. Price: Meltwater offers service and pricing packages to match your specific needs. You’ll need to request demo to find out your price. I have always felt Hootsuite was a mixed bag. On one hand it is one of the most celebrated analytics and social tools on the web. On the other, the tools have a very sharp learning curve that is aimed more towards those who are already adept at highly technical tools than average marketers. But it is hard to argue with results, and Hootsuite always provides them. Download the below comparison as PDF to hand to your reputation manager or CEO. Do you have a tool to add to the list? Let us know in the comments! Ann Smarty is the Brand and Community manager at InternetMarketingNinjas.com as well as the founder of MyBlogU.com. Ann has been into Internet Marketing for 10 years, she is the former Editor-in-Chief of Search Engine Journal and contributor to prominent search and social blogs including Small Biz Trends and Mashable.